Happy Monday! That means it's time for another one of Mary Jo's great Monday Lunchtime Sketch Challenges. You can check them out here. 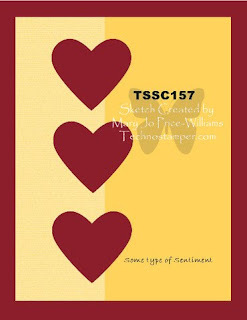 I got my inspiration for the colors of my card from Stampin' Royalty's Challenge #54. You can check out their blog here. This was my first version of the card. It matches the sketch but I still thought mine looked a little plain. So, here's my second version. I added ribbon along the green cardstock, although it's hard to see because the circles are close together. However, the big bow on the top is quite obvious! :) It just made the card a little more fancy. The original sentiment with the mug says, "Love you a latte!" However, what I really needed was a "thank you" card. So, I used "thanks" from one set and added it to "a latte!" Look for ways to see and use your "old" stamps in a new way! So cute! I have yet to use that image (although I've had this stamp set for some time!) and love what you've done with it. Like the ribbon version best...but then, I'm a ribbon gal! Love, love these teacups. Why I still don't have them is beyond me. Thanks for playing with Stampin' Royalty. Love this. Those tea cups are one of my favs. Thanks so much for playing along. You should try to add the code so people can hop right from here to go to the next sample. Suoer cute! Great use of that stamp, too! Thanks for playing this weeks Stampin' Royalty Challenge! I like them both. Do we have to choose between them? Great job with the colour combo. Thanks for joining us at Stampin' Royalty this week. I love them. Thanks for sharing them. Say hi to our buddy Frank. Pretty card and the colors are wonderful together!